Acorelle Organic After-Sun Body Lotion repairs and soothes your skin after sun exposure. Rich in organic peppermint floral water and coconut and monoï oils, this natural body lotion provides instant freshness and comfort to your skin. This 100% natural scent non-sticky light-weight formula is quickly absorbed, leaving your skin replenished and cooled down ! After Sun bathing, chill out with Acorelle Organic Refreshing Body Lotion ! 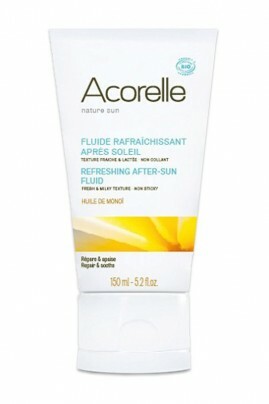 Apply Acorelle Organic Refreshing After Sun Lotion in gentle massage on your face and body. Apply on clean healthy skin. Do not swallow. Avoid all contact with eyes. Keep away from heat and light. Do not protect from UV-rays. A bunch of fresh natural ingredients to replenish your skin !